Born in Chatham, Ontario, in 1942, Ferguson Arthur Jenkins was discovered by Philadelphia Phillies scout Gene Dziadura at the age of 15. While he initially had dreams to become a professional hockey player, Fergie’s 21-year professional baseball career began with the Phillies in 1965. From 1967–1972, while a member of the Chicago Cubs, Fergie accomplished an incredible achievement of six straight 20-win seasons, winning the 1971 NL Cy Young Award as the league’s top pitcher. In 1974, after being traded to the Texas Rangers, Fergie won the American League Comeback Player of the Year Award, winning a career-high 25 games. He remained in Texas for one more season before going to the Boston Red Sox for two years, and then back to the Rangers for four more seasons until 1981. Fergie retired after the 1983 season, returning to Chicago and retiring as a Cub, not long after recording his 3,000th strikeout. At the time, he was the only pitcher in baseball history to strikeout more than 3,000 batters while accumulating less than 1,000 walks (997), a feat only since matched by Curt Schilling, Pedro Martinez and Greg Maddux. Career Highlights include the following: the first and only Canadian to be inducted into the National Baseball National Hall of Fame in Cooperstown, NY, July of 1991; induction into the Canadian Baseball Hall of Fame at St. Mary’s, Ontario, 1987; Lou Marsh Award recipient as Canada’s top athlete, 1974; Canadian Press Male Athlete of the Year 1967, 1968, 1971, 1974; inducted onto Canada’s Walk of Fame in 2001; received the Order of Canada, 2007; Inducted into Oklahoma Sports Hall of Fame, 2012. On March 18, 2009, it was announced by the Cubs that Fergie’s number would be retired at Wrigley Field in Chicago. In a ceremony on May 3, 2009, Fergie’s number, 31, was raised up the historic left field foul pole, enshrining him among the other greatest Chicago Cubs players in its storied 138-year history. 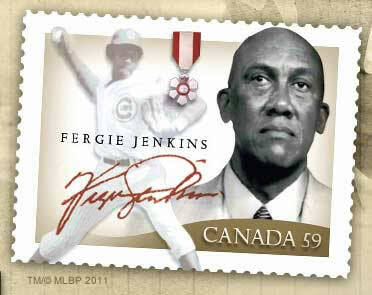 In 2010, Fergie was honoured with a Canadian Postage Stamp in conjunction with Black History Month. In February 2011, he traveled to 46 cities across Canada, promoting the stamp and speaking on behalf of Black History initiatives. His charitable foundation, the Fergie Jenkins Foundation, was founded in 1999 and continues to operate out of St. Catharines, Ontario, raising more than $4-million for hundreds of charities across North America. In 2011, the Fergie Jenkins Foundation doubled its office size to accommodate the development of the Fergie Jenkins Baseball/Black History Museum. The facility, scheduled to open to the public in mid 2013, will celebrate Fergie’s athletic and humanitarian accomplishments, showcase his vast collection of sports memorabilia and serve as an educational tool for local youth.